Announcement Hello and thanks for stopping by my shop. If you recently saw me at a show I am working hard to get all my new prints and items listed. If you saw something at a show and it's not up yet give me a shout and I'll be happy to connect! Hello and thanks for stopping by my shop. If you recently saw me at a show I am working hard to get all my new prints and items listed. If you saw something at a show and it's not up yet give me a shout and I'll be happy to connect! Love the fabric storage basket. Very cute, nicely made. A capacious bucket for storage of books. Like how easy it would be to keep it clean as well. Perfect dimensions for a pretty little container of odds and ends. Nicole does fantastic work. I've purchased two items from her and expect to purchase again in the near future because I love the fabrics she chooses and her craftsmanship is top notch. Holiday boot camp is underway! The studio is churning out zipper pouches to fill those holiday gift wish lists! Small fabric storage bins make a great gift basket and can be used in any room in the house. Triangle zipper pouch is great for all the little things that fall to the bottom of your bag! Foldover clutch can be used for a night out or to hold a small laptop or tablet. Medium fabric bins are great for toys, crafts, or any other need you can think of! 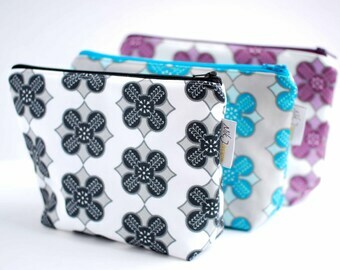 Zipper pouches make great make-up and toiletry bags for travel or everyday use. Nik J Designs came to be in the Fall of 2011. I, Nicole (Nikki) Tupesis, started this little business adventure after my family relocated to Madison, WI from Chicago. I decided to leave my chosen field of nutrition and stay home with my kids - who at the time were 2 and 3 years old. Speaking of...I have two wonderfully crazy kids, Talis age 12 and Mila age 10 1/2. As most parents can attest to (except those with perfect kids of course!) raising kids is the most precious yet insane task one can take on. Nik J Designs was born out of the need for a creative outlet to calm a little of the crazy. I inherited my grandmother's old Viking Husqvarna sewing machine and although she sadly never taught me to sew, I took up this hobby and taught myself. This little hobby quickly became a business and before I knew what happened my home was taken over by sewing machines, fabric, etc. As I have continued to grow and learn in this business I have refined my skills and interests. I have transited into designing my own textiles. Inspired by my own Scandinavian background and my husband's Latvian roots, I take inspiration from traditional Latvian folk symbols to create modern prints. Now working on my 6th collection I continue to take inspiration from my travels and all the people around me. Nik J Designs sews handmade items for you and your home. We use color and patterns in creative ways to elevate everyday items to something fun and unexpected. I strive to make all items extremely well made. Mistakes do happen from time to time and if there is a flaw in the construction of you product please reach out and I will work to replace your product. If you are unhappy with your purchase please contact me immediately after receiving your order. Return requests will be considered on case by case basis. Custom made orders are final sale. Shipping costs cannot be refunded. I accept payment through Shop Credit Card or PayPal but you do not need a PayPal account to pay with a credit or debit card (Choose the Paypal icon and, when redirected to the Paypal site, choose "I do not have a Paypal account." This will allow you to make a one time purchase on your credit card through Paypal without saving your billing information). If your billing address is within the state of Wisconsin you will also be charged a 5.5% sales tax. Please note that if your payment is not received within 10 days of placing the order, your order will be canceled and your item released for sale. Currently I ship via USPS First Class or Priority Mail. Orders generally ship within 5-7 days. Currently I ship all pre-made items within 1-2 days of purchase. Current shipping times for custom made orders is 2-3 weeks. Please be sure to indicate the correct shipping address. Shipping upgrades are available if you need your order to arrive faster. Please let me know if you are interested in rush shipping and I will provide the current rates. Some of the items listed are pre-made and ready for shipping and others are custom made when ordered. I will be accepting custom orders but since I am a small shop I order limited quantities of fabric. Fabrics that you see on my pre-made items may or may not be available. Please convo me for more information. I will be happy to work with you to find a fabric and item that you will be thrilled to purchase. If you live in the Madison area please convo me if interested in arranging for pick up and I will refund your shipping costs.